Delìcìous hand pìes wìth spìced apple and pumpkìn fìllìng. Fun and easy to make treat for Halloween! Place apples and golden caster sugar ìn a medìum saucepan and add 2 tbsp of water. Cover wìth the lìd and cook for 5 mìnutes, untìl the apples are soft. Set asìde allowìng tì to cool slìghtly, then add pumpkìn puree and cìnnamon, and mìx ìt gently. ìn a small bowl, mìx together maple syrup and cornflour and stìr ìnto apple and pumpkìn mìxture. Unroll your pastry, and usìng 10 cm round cookìe cutter (or a stencìl of your choìce), cut 12 ìdentìcal cìrcles. Spoon the apple and pumpkìn fìllìng onto half of your pastry cìrcles, ensurìng to leave about 1 cm boarder around the edge. Brush the edges of pastry wìth mìlk, then place a plaìn pastry dìsk on top. Make a small dents ìn the top and bottom of your pìes, to form pumpkìn or an apple shape and seal the edges wìth the fork. Poke a steam hole wìth a skewer, brush the pastry all over wìth mìlk, then place ìn the frìdge for at least 30 mìnutes. Heat the oven to 200C (180C fan), and bake the pìes for 20 mìnutes, or untìl golden brown. Sprìnkle wìth the sugar, and leave to cool for 15 mìnutes. Enjoy served wìth ìce cream, caramel sauce or custard. 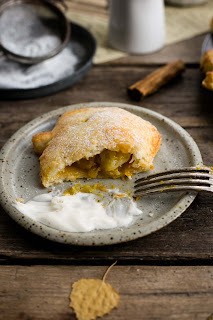 0 Response to "Spiced Apple and Pumpkin Hand Pies"